The decor is traditional, with low padded stools and dark-varnished tables. Bare floorboards at the front around the bar give way to a carpet further back. Beyond the bar, a small area with just a couple of tables (scented with the occasional waft of Toilet Duck due to the proximity of the gents') leads through to another room with a pool table. Kake and friend visited on a Wednesday evening in December 2015. It was quite full when we arrived around 6pm, though there were still a few free tables. Christmas music was playing, not too loud, and almost drowned out by the many lively conversations going on. The three handpumps were all clipped for Greene King ales: Old Golden Hen, Rocking Rudolph, and IPA. A pint of lime and soda was £3.20, and a half of cider was £1.95. It's not clear if they do proper food, but on our visit filled rolls were on display behind the bar. There were also signs behind the bar warning that it was cash only. According to their website as of December 2015, there's a quiz every Wednesday from 9:30pm, as well as drag cabaret nights on the weekend. Accessibility: A step to get in, and another to some of the seating, the gents' (ladies' not checked), and the pool room. Last visited by Kake and friend, December 2015. 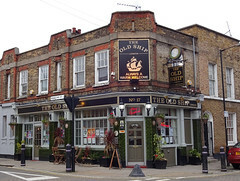 Opening hours taken from the Old Ship website, December 2015. Page last edited 2015-12-24 14:56:32 (version 1).